What’s summer without ice cream? Whether chocolate,or pretzel/candy-coated chocolate pieces/peanut butter cup, you can rest assured this Homemade Honey Ice Cream recipe will be delicious. Whisk together eggs, honey, and salt in medium bowl. In medium saucepan, bring half-and-half to a full simmer with any infusions. Remove from heat. Refrigerate until completely cool. 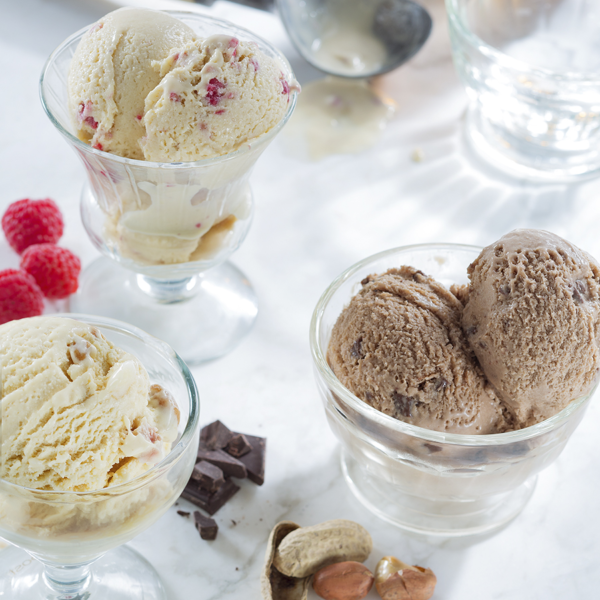 Process custard in ice cream maker according to manufacturer’s instructions; add soft ingredients such as 1/2 cup sliced bananas or raspberries half way through freezing, or chunky ingredients like nuts or candy during the last 2 to 5 minutes. Transfer to bowl or tub, add any desired swirls and serve, or cover and freeze until firm, at least 3 hours and up to 3 days. Add-ins: Half way through the churning add up to 1 cup of fruit. Or, during the last 2 to 5 minutes add 1/2 cup nuts, bits of pure honey comb or chocolate bits.